Link: SUPER BOWL COMMERCIAL highlighting the "Coin"
The island design is successful at both the human scale and monumental scale. Attention to detail through to project completion: The red brick and limestone composition of the Coin reflects both the materials of historic Buchtel Hall, and the newer facilities adjacent to the medallion. Standard full and 1/2 size brick units were used for the circular pattern. The configuration eliminates the need for numerous odd shape wedge cuttings, or expensive custom molds, thereby saving on labor and material costs, and delivery time. (The tight circular patterns commonly available for precast concrete pavers, are a rarity for clay bricks. Clay bricks were used for their greater color retention.) A slight convex rim deters skateboarders. Beveled letter edges resist chipping. Durability - A decorative low rising retaining wall protects the Coin from snowplows and road salt. A slab base with (4) concrete piers extending below frostline stabilizes the coin permanently and prevents slight rotations of the Coin due to uneven settlement or uplifting, potentially noticeable due to the perfect alignment of the letters. 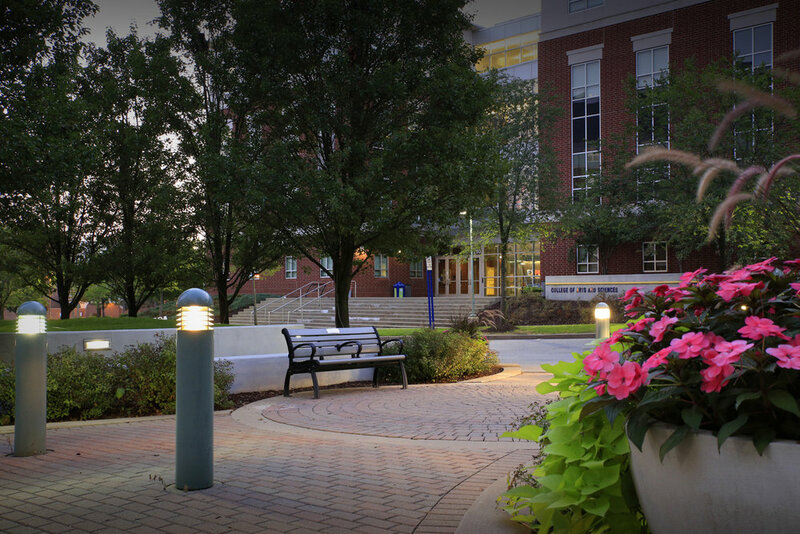 The new University “Coin” and landscaping serve to balance two opposite functions. As a decorative sculpture, the Coin is a highly visible iconic landmark for the University throughout the entire year, day and night. Concurrently, the 20’ diameter Coin and the Cleveland Select Pear Trees serve to enframe historic Buchtel Hall, shown beyond in silhouette. The island design effectively unifies the campus core, linking the University’s historical past (background) with the state-of-the-art facilities of the present flanking the Coin to create a total design. Together with the buildings, the Green effectively serves as the primary campus gateway from the North. Durability - A decorative low rising retaining wall protects the Coin from snowplows and road salt. A slab base with (4) concrete piers extending below frostline stabilizes the coin permanently and prevents slight rotations of the Coin due to uneven settlement or uplifting, which could be noticeable due to the perfect alignment of the letters. The new island Green seamlessly integrates with the older historic campus core to to the south highlighting historic Buchtel Hall. Ever changing year-round color and textural effects adds freshness through the seasons. Eastward view of the Arts & Science Building through the island crosswalk. A comfortable place to sit in the middle of a relatively narrow cul-de-sac, complements the architecture while offering interesting cross-views through the island. Looking north from Buchtel Hall and Fountain Court (the old campus core) presents a different view of the island. The tower clock and formal landscaping at the south end serve as a vital secondary landmark and visual tie to the extended campus core. The island design offers dynamic views from all vantage points: north, south, east, and west. With Buchtel Hall and Fountain Court removed from the project scope, it was critical the island design offer effective core unifying views from all over - without overdoing. The “sunken” central crosswalk, now hidden from view, does not interrupt the sense of a continuous green. The existing cul-de-sac road layout and curbing was preserved to save on materials, energy, and construction costs. The trees, plant material, tower clock and coin offer seasonal variety and interest throughout the year, day and night. All trees and plant material were chosen for their ruggedness, adaptability, and their tolerance of road salt with minimal maintenance. The birth of a cultural campus ritual has emerged on the green, injecting a new vibrancy into campus life. The embracing of the Mary S. Corbin Green by the students and community is apparent by the regular observation of students and citizens taking photos around the island, adding to school and community pride. Notably, student group photo-ops have become commonplace on the Coin. The Green has become an integral part of the University culture and has galvanized new social rituals. There is a real human element associated with pride integrated within, a vital ingredient to a vibrant college campus. A campus identity has been achieved. Top photo courtesy The University of Akron Honors College Group. Buchtel Hall, shown in the background and Fountain Court, shown between the island and Buchtel Hall, were eliminated early on from the campus core project scope due to estimated costs. (See the existing conditions site plan.) The challenge was to find creative ways to do “More with Less”. To help unify and link the Mary S. Corbin Green to Buchtel Hall, there is no attempt to hide the contrasting style of the existing fountain. Combined with a simple low hedge, a clean sloping lawn, and a distinctive plaque, the elevated tower clock subtly blends with the style of the fountain while complementing and drawing attention to historic Buchtel Hall beyond. The Plaque honors the donors who were financially responsible for transforming the design of the Green into a reality for the students, University, and community to enjoy. Attention to detail through to project completion. A slight curve atop the letters allows for drainage. Distinctive views from far away or up close and from all vantage points. From a distance the Coin / Mary S. Corbin Green works with the scale of institutional buildings and a large open space, yet simultaneously is of human scale with detailing that is appreciated up close. The north campus gateway is visible for 2 city blocks. Ever-changing colors refresh the Green. 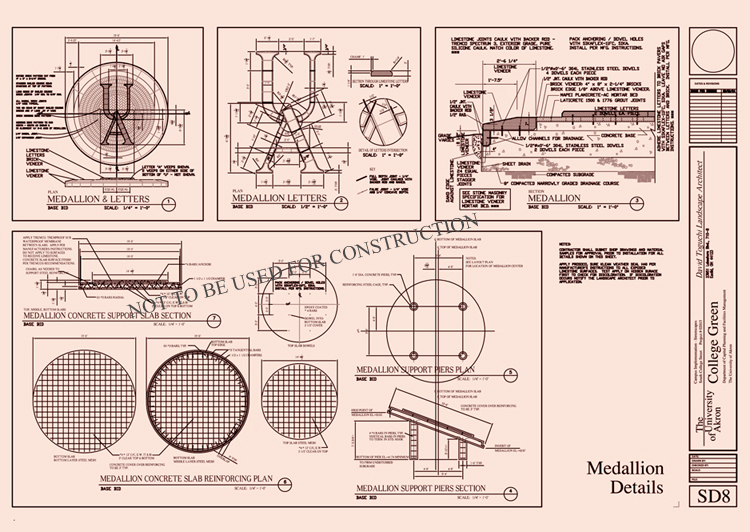 Construction details sheet for the Coin. David Toguchi Landscape Architects was the prime consultant responsible for the design of this project and its completion through construction documents and construction contract administration. The design creates a dynamic identity and north gateway for the University, while seamlessly unifying the old historic campus core with the newer north core. Students have demonstrated their University pride and taken ownership of the green through ritualistic group photo-ops on the University "Coin". Landscape architectural services included: analysis, planning, design, cost estimating, demolition, plaza, green, streetscape, planting, decorative paving, retaining walls, grading & drainage, site furnishings, tower clock, lighting, donor monument, University signature monument, conceptual fountain, accessibility and code compliance. David Toguchi Landscape Architects worked closely with Capital Planning throughout this project to meet the requirements and needs of the University. Ornamental grasses melding with the surrounding woods and landscape in the Fall with seasonal color changes throughout the year. Minimal maintenance and zero watering. 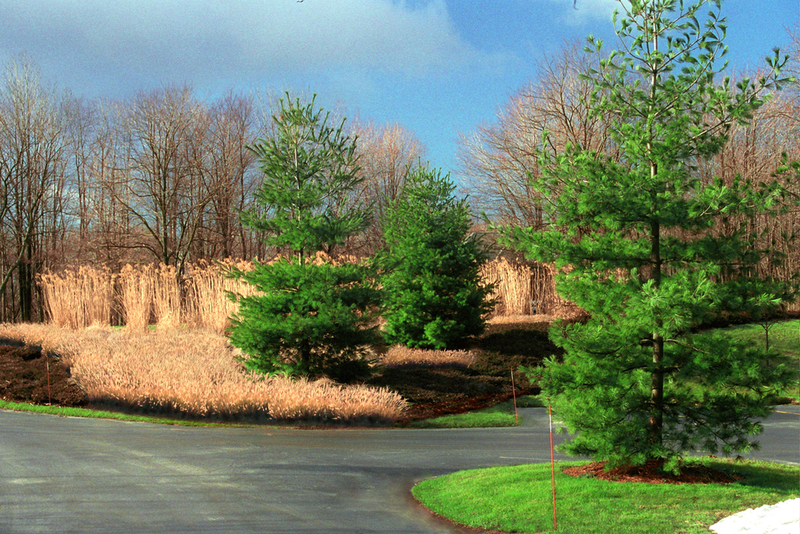 The wheat colored ornamental grasses contrast with the groundcovers, pine trees, and background woods, providing a textural winter landscape. The landscape provides year-round interest. Xeriscape design with sustainable design and green design qualities. Plant material is very rugged and very low maintenance with no / minimal watering requirements. After initial installation, the plant material has never been watered for over 12 years. Once a year, in early Spring, the ornamental grasses are cut back and fertilized once. The lawn, parking lot and background woods were pre-existing. The design provides 4 season interest and changes throughout the year. Plantings arranged in layered sweeps on a sloping bank results in a colorful display of textures. The plantings meld with the existing open lawn and background woods creating a single unified design – balancing the “masses” and “voids”. Through the use of ornamental grasses, the design starts to take on a wildflower prairie grass look. This independent project involved creative and comprehensive problem solving on many levels. Comparisons between this concept & master plan and the City's is encouraged. Specialization is absolutely vital to the design industry with its increasing complexities. However, “Big Picture” or wholistic thinking seems to have become a lost art and/or is minimized or ignored. You sometimes hear much talk about it, but in reality it is extremely rare to see legitimate examples of it. This comprehensive concept and master plan offers solutions to century old problems that have never been successfully solved. The shown pedestrian bridge links all four quadrants of Cleveland Public Square, while existing pedestrian street crossings are maintained. The bridge “deck” emerges from the earth and becomes part of the parkspace itself, available for various human activities. The greenway bridge becomes a magnet for outdoor human life. Aesthetic pedestrian bridges have often been built as people attractors – not to be confused with skywalks which are specifically designed to keep people inside the buildings. Every form aspect of the bridge directly evolved from solving pedestrian connectivity issues, while maximizing usable park space, and meeting federal and state codes. I.e., the entire physical form of the bridge is a direct result of resolving the physical limitations of the site for human needs, while maintaining vehicular access through the square. This wholistic concept gives the downtown core a powerful unifying one-of-a-kind identity which it sorely lacks, focuses specifically on pedestrian connectivity (greenways), and unifies Cleveland Public Square with The Mall and the Downtown Waterfront while complementing the surrounding historic architecture on Public Square and The Mall. The City of Cleveland has been trying unsuccessfully to join all 4 quadrants of Public Square for over 150 years, including a number of major national design efforts, “The Heart of Cleveland, Public Square in the 20th Century”, by Gregory G. Deegan and James A. Toman, and unify Public Square with The Mall for over 100 years. This concept does both while maintaining unimpeded vehicular traffic on both Superior Avenue and Ontario Street, which is conducive to the needs of the main transit hub of the City. David Toguchi received a U.S. Patent on the bridge structure. The bridge creates a powerful visual gateway and a signature identity to Public Square and the City Center which is currently lacking on both counts. A memorable experience is created for both the pedestrian as well as those arriving by vehicle into the historic core. A complete understanding and “feel” for Public Square (as it exists now) cannot be achieved without visiting and walking the Square and through the quadrants at night, including later hours. The safety factor as well as the perception of safety changes dramatically at night. Over the years there have been several design proposals (among numerous others) which have proposed creating one large vast greenspace on Public Square by either closing off Ontario St. and/or Superior Avenue or having the street(s) “tunnel” below. Creating a much larger greenspace than what exists creates additional security issues which must be addressed during the day and more so at night. The “eyes on the street”, (Jane Jacobs), become diluted or are eliminated. The activity (vehicular, pedestrian, bus waiting) near street level which currently exists to some degree even late at night, adds some feeling of security. The further one is removed from this street activity, the less visible and less secure one feels. Possibly, some day, downtown Cleveland will establish a more pervasive ingrained nightlife culture similar to some other cities, and Public Square will be buzzing with people at night. However, this bridge concept resourcefully makes use of the available “eyes on the street”, in addition to being a people magnate to help nurture a more lively downtown culture. As shown and in other photos, wide open panoramic views are created throughout the Square, thereby contributing to safety as well as the perception of safety, both of which feed off of one-another – not to mention adding to the grandness of the space. All areas anywhere have high visibility. An important aspect of evaluating a designed space is to see, feel, or visualize things at “eye level”. This is how one usually will experience a space. “Bird’s eye” or plan views are very important in showing the overall layout or organization of a space, but are much less useful in conveying how you will experience and “feel” in a space. This is not a new concept, and is partly common sense, and is often neglected, forgotten, or misunderstood. A number of excellent books address this very issue, e.g., books by Gordon Cullen (serial vision), Kevin Lynch, Jan Gehl and others. Each quadrant possesses a different microclimate and orientation, is unique in function and is flexible in use to accommodate many different people and uses through the continually changing weather, time of day, and season. The special night lighting possibilities of the arches and bridge decks (above and below the decks) are limitless. The entire physical form of the bridge directly evolved from the desire to link all four quadrants of Public Square for pedestrian access and use, while maintaining vehicular traffic below on both Superior Avenue and Ontario Street. Furthermore, the bridge is designed to meet federal accessibility standards (purpose of the curved deck), ODOT minimum vertical clearances for bridges, and to not be just a bridge but to maximize, meld into, and become part of the useable parkspace itself. 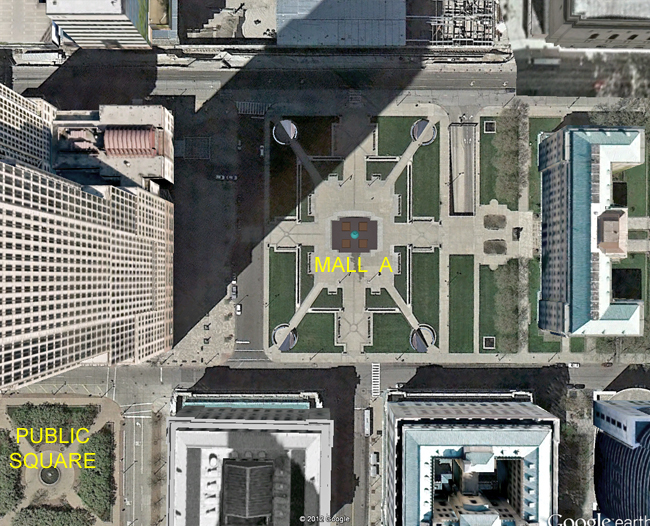 Diagram shows a number of disruptions to pedestrian circulation and visual continuity between Cleveland Public Square, The Mall, and the Waterfront. There is a lack of visual and physical unity between the 3 most important public spaces in Downtown Cleveland, Ohio, all of which sit right up against one-another. The 3 bridges and arches create a powerful visual and physical unity between the 3 public spaces, as well as a magnetic pedestrian flow throughout. This photo shows the existing conditions of Public Square in 2012 prior to the closing of Ontario Street in 2015. Superior and Ontario are both important arteries in the City Center. Public Square is strategically centered among all the major destination points and activities in the City Core. Thus, BOTH streets significantly contribute to the disruption of pedestrian flow / connectivity (greenways) through the central core of the City, as well as chop up this vital public space, severely limiting its usefulness. However, closing off either street creates significant problems for GCRTA's main transit hub at Public Square among other problems. Another significant problem in closing either street, is losing the "Eyes on the Street", especially at night, discussed elsewhere in this project. Closing off streets for pedestrian/people use is becoming a national trend and can be very beneficial to enhancing city life and health. However, each situation must be evaluated independently, and the cost-benefits and available options weighed carefully. Photo shows the existing conditions of Mall A. 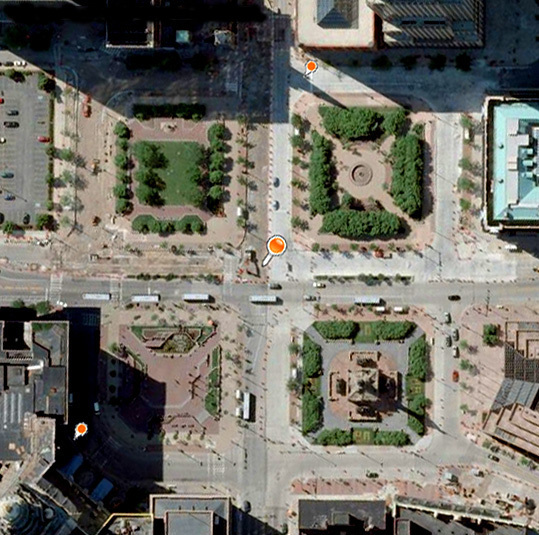 A portion of Public Square is visible in the lower left hand corner. The goal of the City has always been to unify Public Square with the Mall since the Group Plan of 1903. The photo shows how the two buildings at the lower left hand corner seal off any possible (strong) visual connection between the two spaces, allowing for only an odd catty-corner weak visual connection at best, and possible streetscaping enhancements, between the two most important green spaces in downtown Cleveland. Arch superimposed over the existing conditions of Mall A. Arch frames the Terminal Tower and Public Square in the background. Seen arching above the Federal Building from either space, each sister arch maintains a magnetic unifying presence in the opposing green space - See earlier photos of Public Square. Parking garage below Mall A would require redevelopment. Arch superimposed over the existing conditions of Mall A, as viewed from Mall B. Colored Illustration shows the various community elements and their overall organization. Landscape Master Plan for a continuing care retirement community including landscaping, hardscape, and other special features. Park and town square design with a new gazebo, tower clock, and landscaping. Park site planning and design on a limited budget. The project became a rallying point for the local Warsaw community and Coshocton County. Illustrative drawings were used by the Ohio Regional Development Corporation for promotional and fund raising purposes. Many members of the community donated financing of the clock tower, gazebo, park sign, benches, lighting, etc. The local 4-H Club donated time to maintain the plantings. A total community involvement. Conceptual design through construction documents and construction observation. Green infrastructure and sustainable park design with numerous green design elements. Soil cut-fills were balanced and existing topsoil was reused. The native trees and shrubs selected are maintenance free. Greater bio-diversity was created in the existing constructed wetlands by utilizing existing excess soils on site to create more mottled shallows. Demolition Plan, Layout Plan, Grading Plan, Planting Plan, and Details Sheet. Client and Project Director: The Medina County Park District. Constructed Wetlands Management by Natural Resources. Concept Plan by MCPD. David Toguchi Landscape Architects was hired by MCPD to provide the Schematic Design and the Construction Drawings for this project. Natural on-site recycling and filtering of contaminated stormwater from the parking lots and the entrance road through bio-filtration/infiltration swales into an existing constructed wetlands and ultimately into an existing clean freshwater lake stocked for fishing. The typical combined storm and sanitary systems of cities and urban areas are often overwhelmed during storms resulting in the dumping of raw sewage into the lakes. On-site natural bio-recycling systems reduce this burden. Tough native trees, shrubs, and plantings were specified to reduce maintenance, eliminate watering, create habitat for wildlife, and aid in biodiversity and adaptability. Fertilizers, chemicals, and amendments have been eliminated. Many trees and shrubs were chosen for their native ability to survive prairie fires or controlled burns. Many of the above techniques and concepts are adaptable and beneficial to urban areas. The existing constructed wetlands was significantly enhanced through the creation of mottled shallow areas at minimal cost. Design services included: new entrance road, parking lots, fishing lake trails, recreational amenities; existing constructed wetlands improvements; grading and drainage; bio-swales; on-site stormwater infiltration/filtration; erosion control; native plantings; elimination of watering and reduced maintenance and mowing; habitat creation and biodiversity; educational space for an existing astronomical observatory; accessibility & code compliance; cost estimate. The owner plans on seeding native wildflowers and prairie grasses to further reduce cost and maintenance, to further enhance filtration and infiltration, and create additional habitat for wildlife. The owner also has an established program of controlled burning of designated meadow areas to create optimum conditions. Transit facility on a mixed-use site. Integration of multiple uses on site. Brook flows under the stone bridge, partly visible to the right. The fountain well is the source of the flowing stream in the summer, which runs dry in the winter. Ever-changing views unfold along the winding stone path. Landscape colors, textures, and forms provide winter interest. The architecture, landscape, and pond blend and flow well together for a serene winter scene. Earth tone colors, textures, and sculptural forms transforms the scenery in the winter. Water sourced from the bubbling well flows under the stone bridge during the summer. Sculptural boulders, cobbles, and plantings edge the winding bluestone path. David Toguchi worked on this 1/2 acre courtyard project while employed with Johnson, Johnson & Roy, Inc. in Ann Arbor, Michigan. This is a JJR project. Jim Page, JJR was the project manager and design director for this project. David Toguchi’s responsibilities for this project were to provide the Design Development Drawings and the Construction Drawings and portions of the specifications. David Toguchi, with the exception of the lunch court plaza paving detail and retaining wall detail, provided all the courtyard design detailing, including the stonework, pond, stream, dry riverbed, “ancient” well & spillway, stone bridge, flagstone path, and pond stepping stones details. 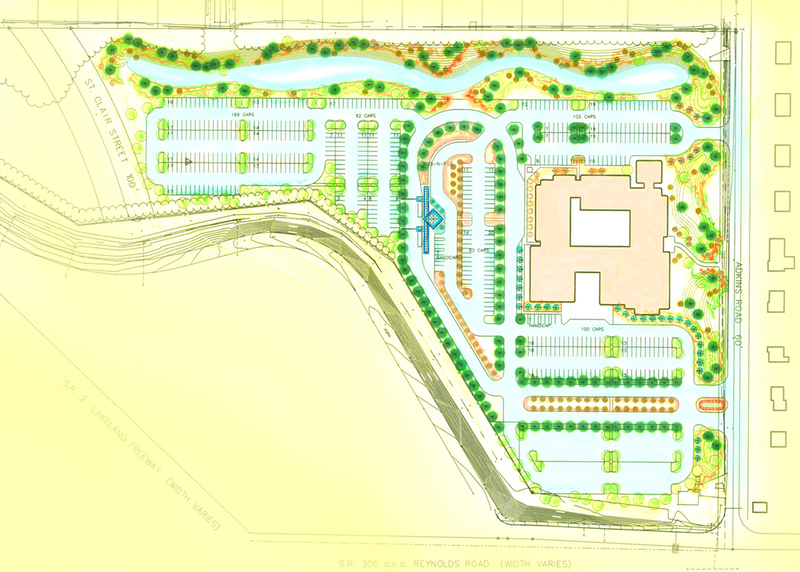 David Toguchi provided the layout and materials plan, site details, grading plan, underdrainage system plan, schematic storm drainage system, landscape lighting layout, and refined the planting locations layout.